As we know, Bangkok is known as one of the most charming tourist city in the world. 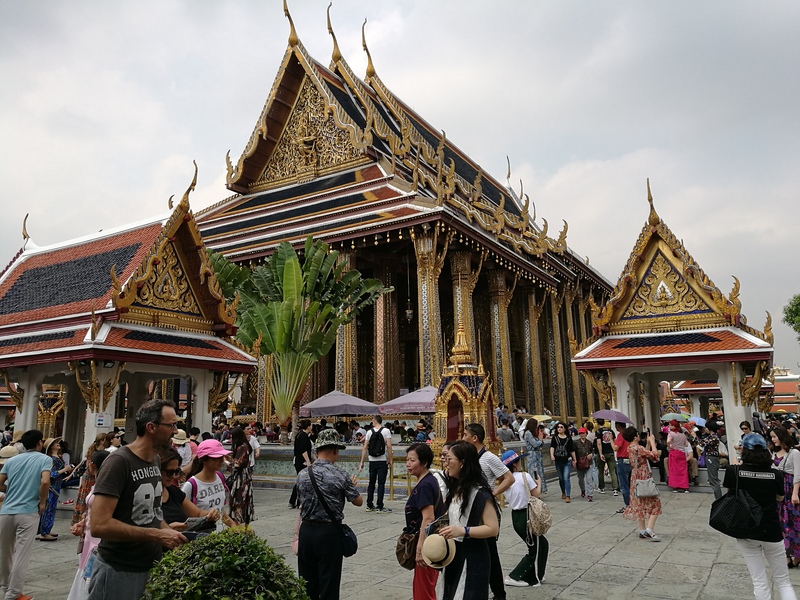 Bangkok is not only famouse for it’s superb architectural palace and gorgeous temples, rich culture and delicious Thai’s cuisines, it is also recognized as one of the top tourists shopping paradise. You can find all sorts of products ranging from from high-end luxury brands at some futuristic megamall, to local affordable brands at bargain night markets. It has so many things waiting for me to explore. With this in mind, I had hop on a trip to Bangkok with my family recently. 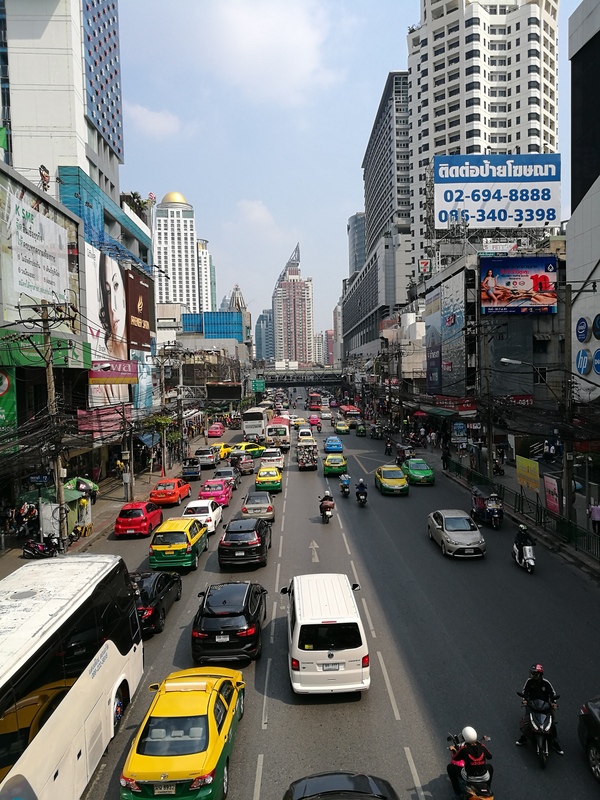 As we want to experience the city life (actually it is because my wife can’t wait to shop at Pratunam Fashion Mall..lol) in Bangkok, we choose to stay inside the city centre. After doing some research online, we finally settled with Centre Point Hotel Pratunam, for its’ bigger than bigger family rooms, and of course most importantly for its’ strategic location along the busy fashion / shopping belt. 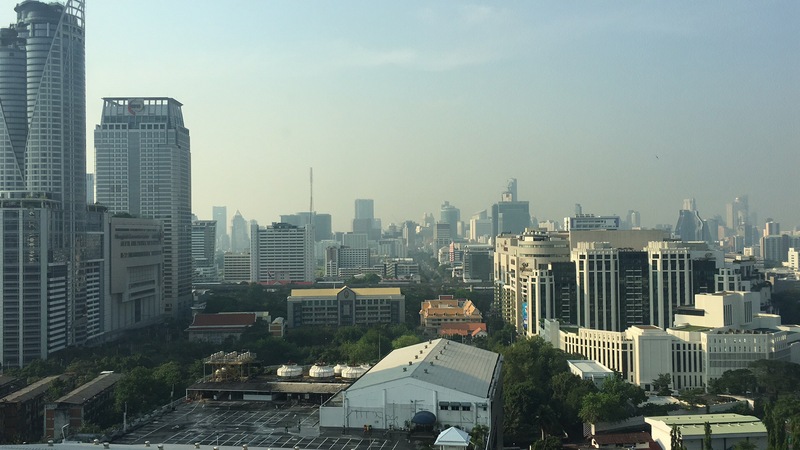 Centre Point Hotel Pratunam is located on Petchburi Road, probably one of the busiest road in Bangkok, with never ending cars and tuk-tuk (sam lor) flowing day and night. There are many local markets, wholesale markets and big shopping malls along both side of this road. The famous Platinum Fashion Mall, Pratunam Wholesale Market, local night markets etc are just minutes walk away. For those who want to travel by public transport, Phaya Thai Rail Link Station is just about 8-10minutes away, providing guests easy access to various nearby shopping areas including Siam Paragon, MBK, Central World Plaza, and Siam Square. And luckily this hotel is situated about same distance from both Suvarnabhumi International Airport and Don Mueang International Airport. Both airports is about 30 minutes drive from the hotel. We were arriving at Suvarnabhumi International Airport from Singapore Changi Airport and were departing from Don Mueang International Airport. That’s why the hotel location is really favorable to me. When you walk out the hotel from the rear exit, you will found yourself is on the road side of Petchaburi. 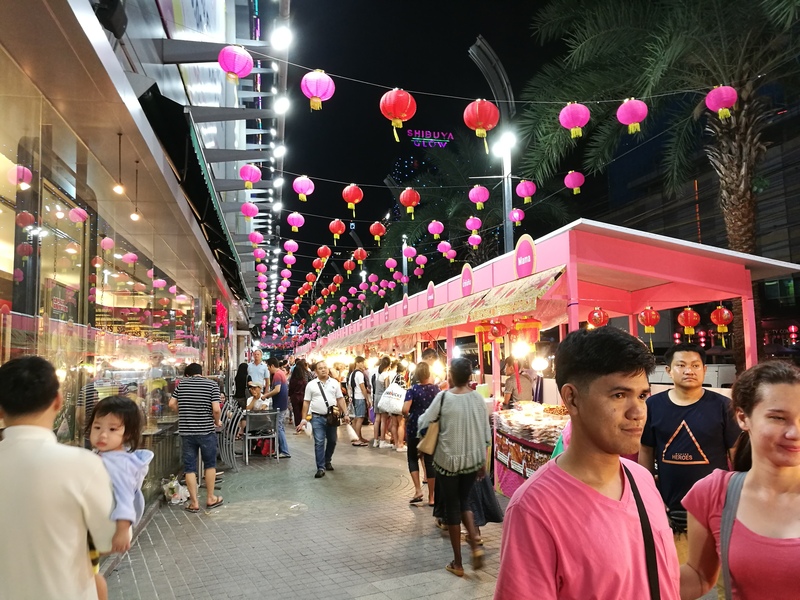 It is packed with hundreds of small stalls selling numerous kinds of cloths, shoes, souvenir, luggages, fruits, craft, art pieces, hand bag and restaurants selling local cuisines etc..and I can tell you the price is very cheap. We really enjoy walking along this street. In fact, we didn’t spend much time staying inside the hotel during our stay, because it is too enjoyable to walk around the streets surrounding this hotel. If you walk out from the hotel main entrance, you will notice there are many spa and massage parlors on both sides of the road. They offer various types of massage and manicure/pericure services, including oil massage, foot massage, Traditional Thai massage, Body Scrub & Oil Massage,Facial Scrub etc..You can choose what you like. I choose Foot Reflexotology and I was lucky enough to have a skilled female massager to massage my exhausted body and legs after a whole day walking on the street. It was a wonderful experience and my whole body and legs were truly relax after the massage. The price is very reasonable also, as it is only starting from 200 Baht. 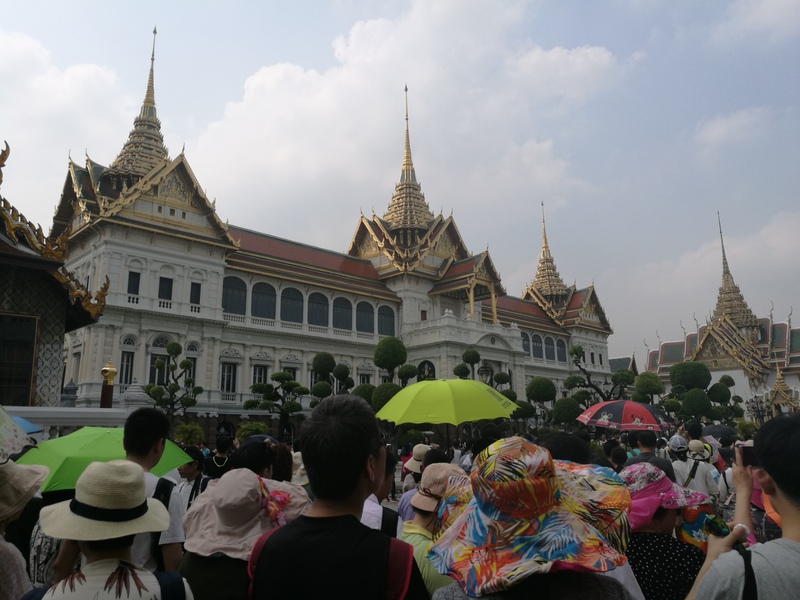 Beside shopping, we did go out to visit some tourist attractions, one of them is the Grand Palace. This is the must see attraction when you visit Bangkok. It is situated at the banks of the Chao Phraya river. Surprisingly it is not very far from our hotel, about 20 minutes drives if there is no traffic congestion. The ticket price is 500 Baht per person to enter the palace. 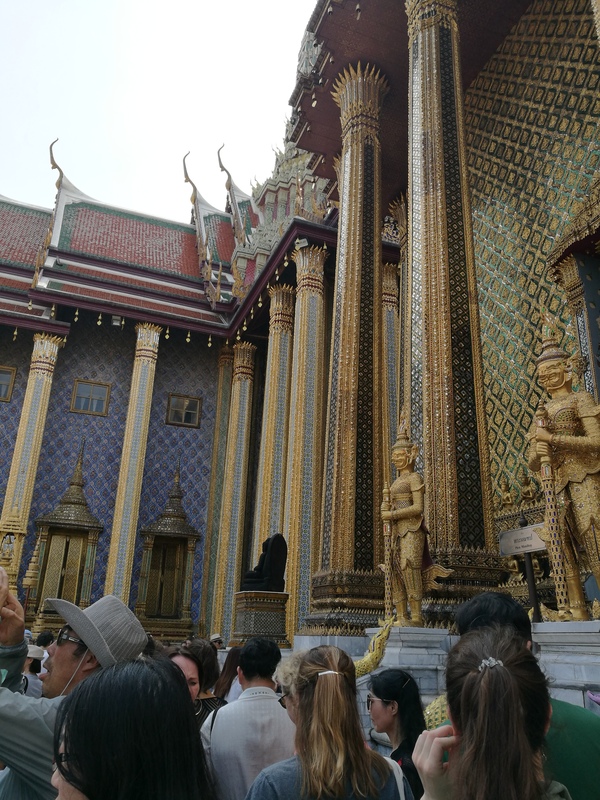 We were truly amazed by the spectacular buildings architectures and sacred temples inside the Grand Palace. 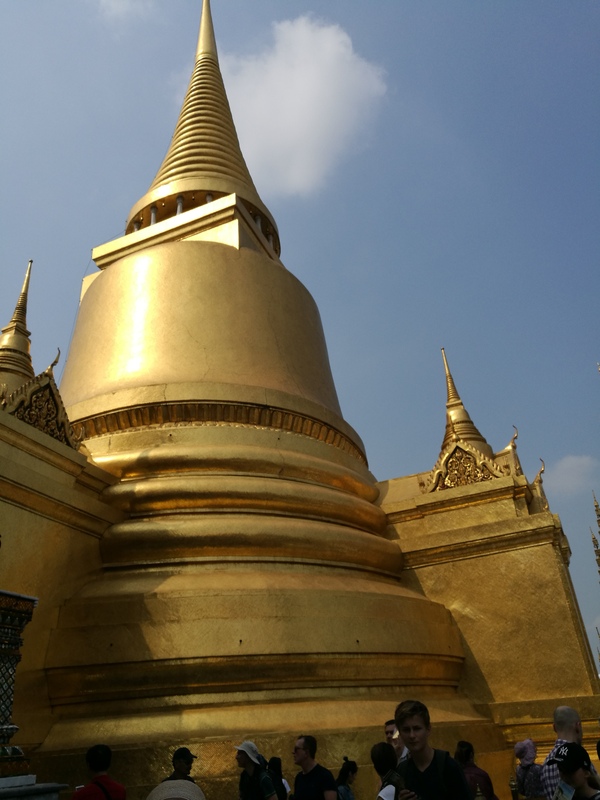 After we spent 2 hours touring the Grand Palace, we are extremely tired and wanted to go for lunch. We were looking for taxi along the road side opposite the Grand Palace exit. While we were waiting, we had a chance to taste some of the local fruits from the sellers along the road side. Surprisingly, these fruits like Manggo, little pineapple etc are extremely delicious. You got to try! After waiting for sometime, we end up jump on a tuk-tuk because it is too hard to get a taxi or Grab car there although Grab is widely used in Bangkok. This is because car and Taxi are not allowed to turn into the road nearby the palace. You need to negotiate the price with the TukTuk driver, I pay 250 from Palace to Centre Pratunam. Tuk-tuks or “sam lor” is originated from an old-fashioned rickshaw during the second World War. It has now become one of Bangkok’s most recognisable transportation features and very popular among tourists. 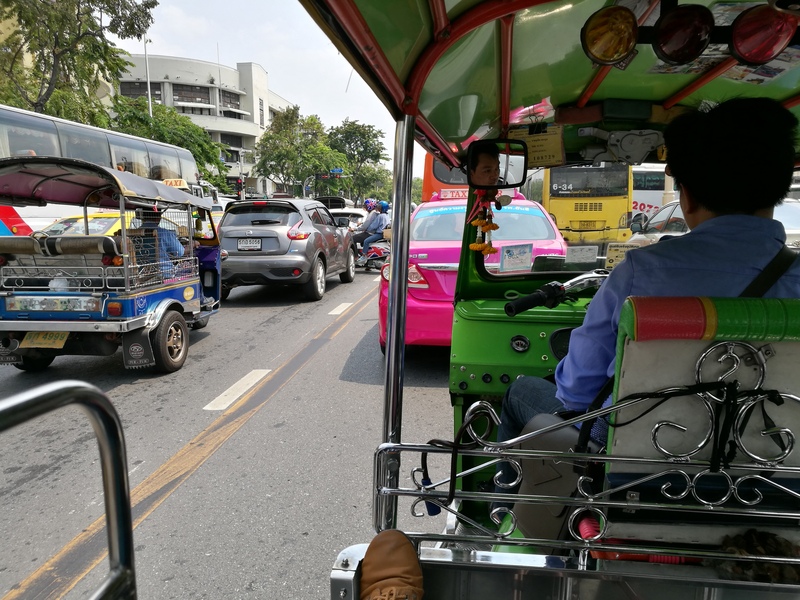 If you are visiting Bangkok, taking tuk-tuk is another must do thing as it gives you very special experience that you can’t get in other country. As for the hotel itself, I would say it is a well kept, clean and comfortable accommodation for guests and families. The hotel staffs are very friendly also and their response to request is very fast. There are few types of room available. Twin Deluxe Executive, Grand Deluxe Twin, Executive Grand Deluxe, Quadruple Deluxe Executive, Family Interconnect Room etc..Most of them have City View and equipped with kitchenette and balcony. 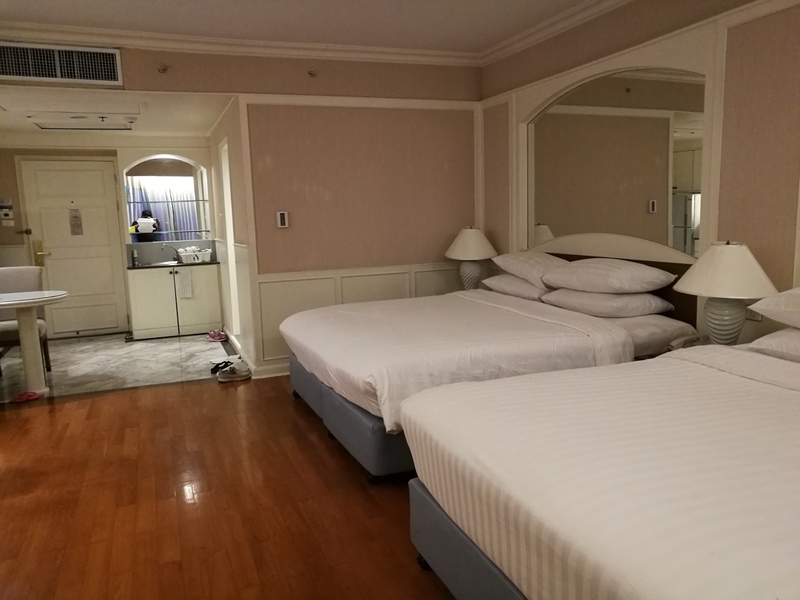 My families were staying in Family Interconnect Room with a total area of 94 square metre. It is very spacious indeed. 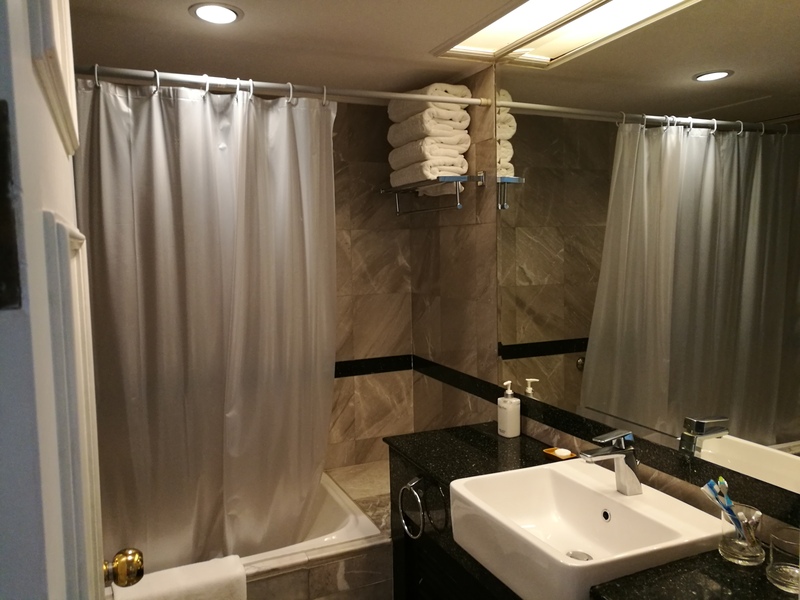 There is kitchenette, balcony (facing Petchaburi Road) and a bath tub in each of this connected rooms. Not to forget Hotel Centre Point Hotel Pratunam is a smoke free hotel with smoking only allowed at certain floor or corner. Therefore it is very friendly to those non-smoker, pregnant women and children. The hotel is fully equipped with internet services, not only in-room but also at every corner and floor. If you are not going out to shop or touring, you can choose to work out at the fully equipped fitness center, or can spend time enjoying in the entertainment room, or spending your lazyafternoon reading beside the swimming pool. Or you can also swim in the swimming pool with jacuzzi, or having a sauna, or playing in the entertainment room etc..If you are bringing your children, you can let them play at the playground, although it is a bit small. One special thing worth to mention is that this hotel has a salt swimming pool, said to be the first and only one in Thailand. It is kind of rare and strange experience swimming in such pool. Make sure you clean your body before and after swimming as the water is really a salty water. May be it is good for health, I am not sure. We really enjoy this fantastic holiday in Bangkok this time, which is full of fun and enjoyment, especially the shopping part. I had spent 50% of my time in Bangkok just to do shopping at Platinum Fashion Mall. This is because the 4 storeys mall is packed with about 1300 stores with all sorts of fashion and accessories selling at bargain price. Just for your info, we have bought a full 28” size luggage of clothing, accessories and souvenirs from Platinum Fashion Mall alone. It is just too convenience for us to go this mall as it is just 400m from Centre Point Hotel Pratunam, and it only take about 5 minutes to walk there. Very convenience. Beside Platinum Fashion Mall and nearby night market, in fact there are many other world class shopping mall in Bangkok, where you can find high end and luxury brands like MC, Jimmy Choo, LV, Channel, etc. For example: The EmQuartier Shopping Complex EmQuartier, Central Embassy, Asiatique the Riverfront etc.. All these malls are easily accessible as the BTS station is just a walking distance from Central Point Hotel Pratunam. I shall return not to Bangkok for another shopping-fun trip again soon. Just too enjoyable to shop in Bangkok. There are even some good news which I gotten from the local resident there. They said most big shopping malls in Bangkok are having annual mega promotion and offers to entice both local and foreign customers from all over the world, if you are a bargain shoppers, you may not let this opportunity slips away. Enjoy shopping in Thailand while enjoying the various attractions and crusine in Bangkok. By the way, if you want to stay at this hotel or any other hotel in Bangkok or other cities in the world, I recommend to use the search engine below which has 2 millions hotels information from all over the world. And the best part is I always get the best available per night price here..:) Before you ever make any booking decision, this website will displays very comprehensive informations and filters for you help you to decide. Most important thing that I like is they even offer FREE cancellation, which I think is very important to me due to my tight schedule. Just key in your check-in date in the form below and you may most likely get the best price per night here. Hope you will enjoy your stay in Bangkok!